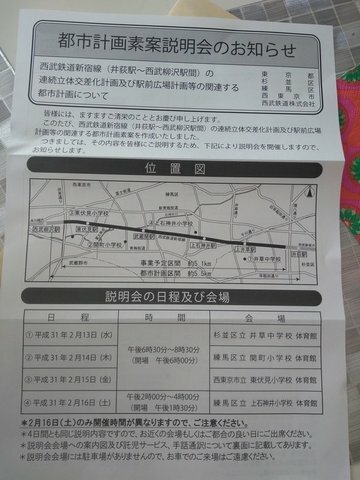 As well as the tunnel stretch between Nakai and Nogata, which is about half-way through the estimated decade-long construction process, there have been rumours that the stretch west of Iogi to Higashi-Fushimi will be elevated, and this leaflet I found in our letter box is an invitation to a public meeting where the plan will be explained. Progress is progress, I suppose, but it will remove an important source of entertainment for small children, particularly little boys, as being taken in your pushchair to watch the train go past seems to be an integral part of early childhood around here. The Squidlet's favourite crossing will be gone, too. Ironically there was a late bubble-era plan to build an express line tunnel under the existing route, for which Seibu added a fare surcharge to raise capital; the plan was abandoned, and the money raised was used to rebuild many of the existing above-ground stations, including a few on this stretch (source), which will now presumably be demolished as part of this plan.